The Henderson, Nevada law firm of Day & Nance was founded in 1987. Since that time has become one of the more respected law firms in Clark County, Nevada. The firm has received an AV rating from Martindale-Hubbell indicating the highest levels of skill and integrity among law firms. The personal injury lawyers at Day & Nance focus on civil litigation and personal injury matters, including appearances before all State and Federal Courts in Nevada, appellate work before the Supreme Court of Nevada and Ninth Circuit Court of Appeals. The firm is committed to delivering the highest level of legal service to its clients, working aggressively to achieve the most favorable results possible in each matter. The firm employs experienced paralegals and other personnel to facilitate and expedite litigation procedures, and has made a strong commitment to technology. At the same time, the firm has limited its practice to certain areas of specialization, which enables the firm to provide quality legal representation to its clients in an efficient and cost effective manner. Once you’ve received your initial medical treatment, you meet with a Day & Nance attorney to discuss your options for your Nevada personal injury claim. Your attorney will apply the law and their experience to your unique circumstances, creating a strategy seeking the best possible outcome. Once you and your attorney have discussed strategy, your attorney will put it in action seeking compensation outside a courtroom or within one. The firm has been located in the Las Vegas Valley since its founding, but its lawyers have successfully represented clients throughout Southern and Northern Nevada including Clark, Nye, Carson City, and Washoe Counties. Because of the global economy and Las Vegas' tourist industry, the firm has represented clients from all over the country and clients outside the United States. Las Vegas personal injury attorneys Steven Day and James Nance have received an AV rating, the highest possible, from Martindale-Hubbell for their exemplary, effective legal work. Our AV preeminent attorneys have served hundreds of injury victims just like you. 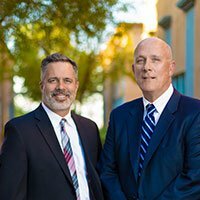 Learn more about Steven and James and their commitment to Las Vegas personal injury clients.